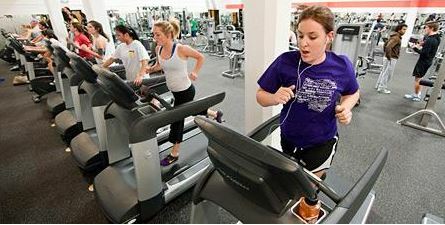 Finding time to exercise in college can be a challenge for even the most diligent of students. At the same time, however, being physically active can be an important part of staying healthy during your time in school. So how can you find the time — and energy — to make sure you exercise in college? Go to class in your gym clothes. Keep it appropriate for class, of course, but if you’re already in comfy shoes, running shorts/pants, and a t-shirt, you’ll be much more likely to pop into the gym after class. Walk to class the long way. Sure, you could take the campus shuttle, catch a ride with a friend, or cut through that creepy grove of trees behind the library, but taking the long way to class is a great way to sneak in a 20-minute workout during an otherwise-busy day. Bike to class. You don’t have to treat your ride like the Tour de France to have it be productive. But riding your bike to and from class is a good way to get a little exercise in — and help the environment, too. Hit the gym between classes. You know that hour you usually use to chat with friends, grab a coffee, and generally just mosey around? Mosey to the gym, catch up with your friends while on the treadmills, and grab a coffee en route to your next class. You’ll still get your regular between-class activities in while also sneaking in a quick workout. Exercise with a friend. One of the best tricks for making sure you get your workout in is to do it with a friend — at the gym, in a pick-up game, playing touch football. No matter what you do, you can hold each other accountable, motivate each other, and make the time go quicker once you do start your workouts. Sign up for an exercise class and treat it like an academic class. Sign up for a yoga or other exercise class and treat it just like a “real” class. Make sure you show up every week and do what you’re required to do each session. Added bonus: A scheduled class means you don’t always have to feel like you should be going to the gym, since you know you’ll be going every Monday, Wednesday, and Friday at 3:30. Sign up for an exercise class that is a real class. Many universities offer exercise classes that you can get credit for. True, they may be harder than your normal whenever-I-feel-like-it workouts, but they may make you more likely to workout. Make a reward system. Consider setting something up, like a Google shared calendar or even something you hang up in your room, where your friend and you keep track of your workouts. At the end of the month, for example, whoever was most consistent, worked out the most, etc., gets treated by the others to something fun (dinner out? pedicure? iTunes gift card?). Join an intramural sports team. Intramural teams are a great way to get exercise while in school. The workouts are fun and you can meet a lot of new people, learn more about a sport, and generally have a great time that doesn’t feel nearly as dreary as running laps alone.